This is a wonderful collection of ten works for Flute Quartet or Flute Choir. Edited by the University of Montana Flute Choir. Works by Pachelbel, Handel, Bach, Mozart, Bizet, and Tschaikowsky are masterfully arranged to sound rich and full. These pieces are accessible to both high school and collegiate ensembles. 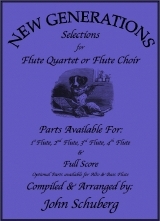 Parts available for: 1st Flute, 2nd Flute, 3rd Flute, 4th Flute & Full Score. Optional parts for Alto and Bass Flutes are also available. To see all of the books organized by instrument that are available from New Generations, click here.